As you all know, there are many garden planters on the market. Containers of all shapes and sizes, something for all gardens big and small. A variety of different materials and colours to turn your outdoor space into plant pot heaven. Lately more people are starting to upcycle unwanted items from in and around their homes. 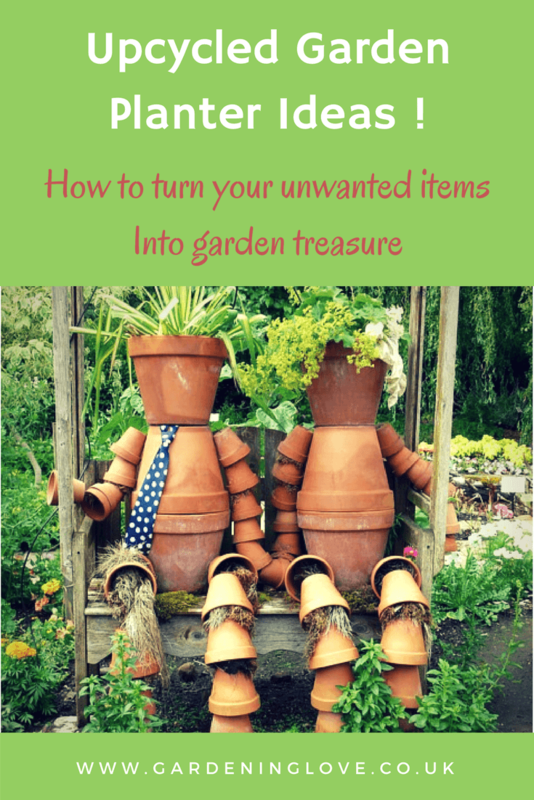 There are some great ideas for turning your unwanted items and junk into garden treasure. We will explore some garden planter ideas further down the post. Spring is all about fresh starts and clearing out. So take advantage and see what you can find lying around your home that you can recycle into a garden planter. You can pretty much use just about anything really. As long as you can add drainage holes to the underneath of the container for water to flow freely. The idea is to use your imagination. A little creativity can go far. This way you are helping the environment by finding practical uses for your unwanted items. Now I know what your thinking 🤔…….. it’s going to look like I have dumped a load of junk in my garden !! I will link my Pinterest board full of gardening ideas and inspiration below. You will see just what can be done ! Trust me, they will look great. Just think of all the beautiful flowers and plants that will be filling them. Adding a different garden planter here and there will bring character to your garden and inject personality. Check out this post on some great flower garden ideas ! Of course what ever you put outside will weather in time. Some materials quicker then others, once they are exposed to the elements. Personally I like this ! I love the rustic look, moss growing and general discolouration all add to the aesthetics. Here comes the fun part ! Time to get planting and stretching your imagination with container gardening. The great thing about garden planters and container gardening is that it opens up so many options. You can move them around, try different positions in the garden. This helps to keep your garden fresh and give it a new look from time to time. You can try putting some planters and pots within your flower beds. I like to do this as I think it gives my garden depth and dimension. A garden planter placed in a flower bed can create a focal point. An area of height where you can really show off your favourite plants and flowers. 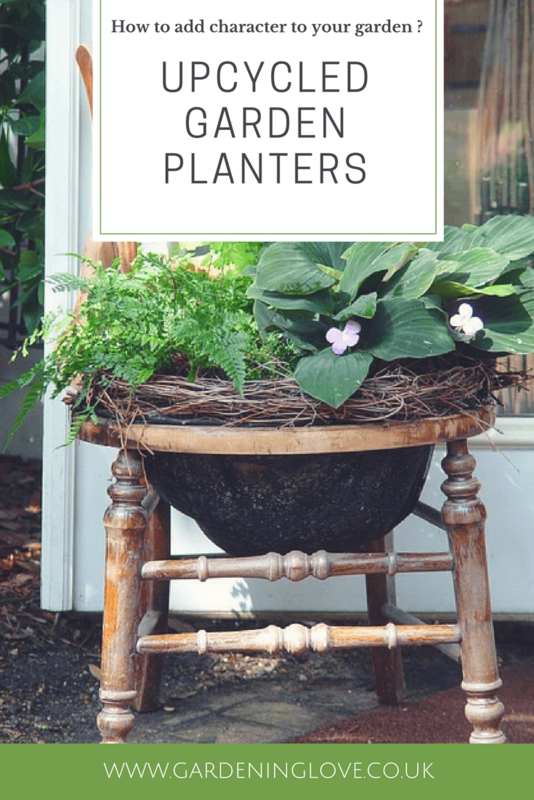 I thought I would share some of the great garden planter ideas that are out there. Hopefully they will encourage you to look at everyday objects in a different light. What was an unwanted household item can be turned into an amazing garden container / plant pot !! Check out my Pinterest garden craft board for tons of ideas…..
Do you upcycle in your garden ? What’s the most unique plant pot in your garden ? Please share and comment below. Oh my gosh. I love this idea!! I love to repurpose things and I need to learn more about gardening. Thanks for sharing! All those ideas are brilliant!! I wish to have similar garden one day. For now it’s a small terrace garden full of herbs and flowers. Thanks for your comment Deborah, sound like you and your husband have a great garden full of upcycled treasure. Your welcome Thelma . Thanks for reading. These are great ideas. I have done some of your ideas already in my tropical garden plants. I love gardening but I can do it only in my home country Philippines. I have only a balcony in Germany. Thanks for sharing. Thanks Lise, glad you enjoyed ! We just moved to an apartment, so no garden for me. I do have a small balcony and I am planning to plant a vertical garden. I have been on the lookout for old pots, buckets and what ever I can fill with dirt. Hoping it will look good as well as grown well!